Happy Thursday! Just typing the word ‘Thursday’ reminds me that I haven’t done a Throwback Thursday post in a while! I’ve been too busy with new polishes lately to wear any of my old ones. Mental note to try to wear an older polish next Thursday to show case an old time favorite. When I saw that Deborah Lippmann was releasing an entire collection that was modeled after last year’s summer favorite “Mermaids Dream” I knew I had to have them all! Well, my bank account couldn’t support buying them all but I did pick up a few. The first one that I decided to get was one that normally would have been at the end of my wishlist. 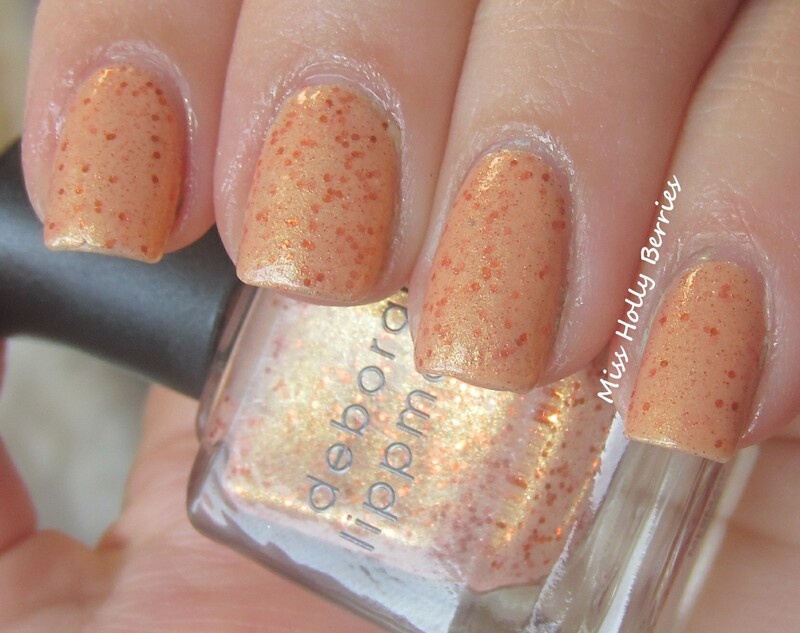 Deborah Lippmann “Million Dollar Mermaid” is a peach foil with gold shimmer and orange glitter. Yes, its a lot going on in this polish, but it doesn’t look that busy on the nail. If you’ve been following me for a while, then you know that orange is my least favorite color polish to wear. Not because I don’t like the color, but because the color doesn’t like me. So I normally stay away from anything orange. But I was so drawn to this in the bottle, I had to try it out. The formula on this polish is a dream. It takes 3 coats to be opaque, but it applies like butter. It goes on so smooth and so easily, its almost like it applies itself. It dries pretty quickly as well so while it takes a few coats to be opaque, I’m not spending forever painting my nails. Overall, while orange isn’t my color I really do like this. But I fell in love with the other one I bought from this collection! What do you guys think? What are your favorite Deborah Lippmann polishes? this would look sooooo good on you jenn! deborah’s polishes are so expensive, do you think its worth it? no problem! anytime! whats your favorite nail polish right now? This looks great on you! I think its gorgeous. It’s different but this reminds me of Hard Candy’s Peach Pop, except Peach Pop is more of a glitter speckled milky peach. Closest polish I can think to this though. I’m still on the lookout for Daytripper.